I know I should be sharing more of my super late back posts, but I just had to share this one asap. It is just.. magical. The photos will not do the glittery-ness an ounce of justice, but just imagine its greatness, and smile. The items listed are clickable links, so you can go scope out these gem items for yourself. OBSESSED! And, just a shot of the base colour on its own. 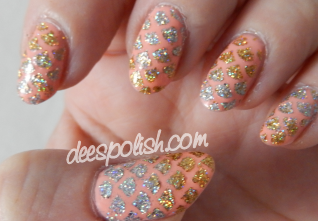 I feel like these peachy colours for nail polish are my new favourite.. I honestly cannot get enough! The formula on this was exquisite. I am thinking I must add more Ellagee polish to my collection.. asap, really. That is all for today - see you again soon! !